For teeth that are badly damaged due to severe decay, or for broken or large chipped teeth, dental crowns can be an effective permanent treatment option. The dental crown procedure utilizes tooth-shaped coverings made of ceramic or porcelain to restore, strengthen and eliminate discomfort. In addition, dental crowns may be used to anchor a dental bridge or to “cap” a dental implant. Typically, the dental crown procedure is completed in two stages. 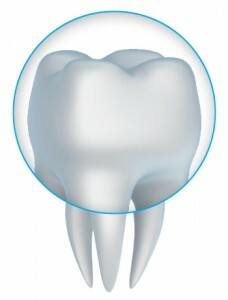 During the first stage, Dr. Weber removes the decayed portions of the tooth’s structure to accommodate the dental crown. Surrounding teeth may also be prepared in this way. An impression is made and sent to the lab, where your dental crown is customized in about two weeks. A temporary crown will be in place between visits to ensure the most natural look and feel. When you return to Dr. Weber’s Gainesville, GA area office, the temporary crown is removed and your new, customized dental crown is securely bonded in place to last for many years to come. Dental crowns are made of metal, ceramic, or porcelain fused to gold metal. The type of dental crown utilized during your dental crown procedure will depend on your unique wants, needs and goals, as well as the recommendation of Dr. Weber. ALL CERAMIC DENTAL CROWNS | Most ceramic crowns are made of one or several of the following components: porcelain, resins, or dental ceramic materials. They create an extremely natural-looking appearance and are typically used on any of the front teeth. The tooth-colored ceramic material is translucent, like the enamel of your natural teeth, and size and shade can be carefully matched to complement the rest of your smile. PORCELAIN CROWNS | A porcelain crown (a dental crown made of porcelain fused to precious metal) is stronger than most all-ceramic crowns and more aesthetically pleasing than those made of only metal. The metal shell gives a porcelain crown an opaque appearance. Porcelain crowns also lack the reflective quality of natural teeth. This type of porcelain crown (i.e. fused to metal) is not as discreet as an all-ceramic dental crown. For a complimentary dental crown consultation, call or email us today to schedule an appointment with Dr. Weber in Gainesville, GA. He can answer all your questions about dental and porcelain crowns.